Last month, I posted about cool stuff for January. As I surf, I discover new services, sometimes nuggets of interest on someone else's blog, sometimes stumbling upon something while doing research. I sometimes feel like we're back in the pre-bubble era. 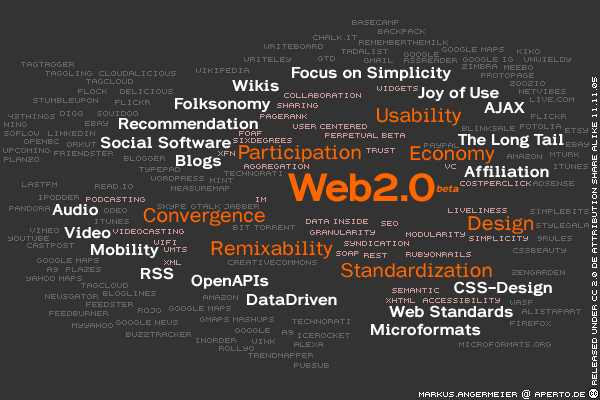 Check out how an exciting era we're living by scooting over 900 Web 2.0 applications classified and tagged for your greatest pleasure and hours of discovery at Go2Web20.net. And if you want to see who's cool and who's loosing ground, head to Movers 2.0. You might have heard about Swivel, a place where you can explore, share, compare and upload your own data sets and use visualization tools. A similar tool, Many Eyes offers some amazing visualization tools that are more dynamic than Swivel. If you are into data visualization, both are worth a look. Web analytics should always be correlated with information about the health of the systems supporting the site itself. Internal monitoring and reporting is important, but sometimes you want to get a better feel of the user experience: just how painfully slow the site can be. Octagate SiteTimer offers a free tool that comes very handy to get a detailed breakdown of each components of a Web page and the time spent waiting and downloading. Other tools offer this kind of breakdown but are part of larger service packages (Gomez, Keynote, etc.). SiteTimer works, it's simple, and it's free. I discovered myFeedz, from Adobe Labs, just a few days ago, but I think I will like it. It merges concepts from Google Reader, Feedburner and Technorati into what promise to be a very powerful tool. Ratings, tags, bookmarking are all there, and unlike other feed readers, myFeeds tries to learn from what you read regularly and accordingly displays news items / blog posts that might be of interest to you.